As always, thank you for keeping this issue “front and center”. 2. Inform the consulate they have previously committed a relinquishing act. In either case, they are asking the consulate to help them obtain – what is the most sought after document in the world today – that is a certificate of loss of U.S. nationality (CLN). Furthermore, some are paying “big money” to achieve this. There is NO QUESTION that the numbers of those actively seeking the CLN are under-reported. A. They are no longer U.S. citizens in their minds and hearts. B. They are willing to never return to the United States. This is by far the largest number and at the end of the day, this is the greatest tragedy. The very rich and the very poor can afford to formally relinquish. The “middle class” can’t afford to come into tax compliance or if they are in tax compliance, they can’t afford the “Exit Tax”. The simple truth is that a person who owns a “mortgage free” house in most major cities coupled with any attempt to save for retirement, means they will exceed the two million threshold on paper. In other words, for the middle class to officially “relinquish citizenship” means they will have to turn their retirement assets (which were never earned in the U.S.) over to the IRS. So, that’s the deal. Barack Obama promised “change we can believe in”. What he delivered was “change we could never imagine”. Also, Americans abroad have traditionally been good ambassadors for America. Obviously, that is no longer so. In fact many Americans abroad are now very “anti-American”. In a world where the U.S. is widely disliked, where it’s official ambassadors are distrusted and ridiculed, the U.S. needs all the “unofficial ambassadors” it can get. In the past the U.S. has had benefited from its citizens abroad – who have (on the whole) been loyal and patriotic citizens. Finally, although Homeland Americans don’t care about this, if they paid attention, they would see how the U.S. government has put an “iron curtain” around the U.S. This is how we treat those who have already left the U.S. This is what will happen to you if you leave the U.S.
Perceptions of U.S. citizenship abroad – How you will be treated if you leave the U.S. 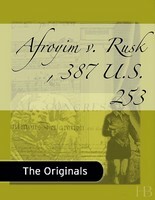 This entry was posted in Citizenship-based taxation, Constitutional issues, Dangers of immigrating to the U.S., FATCA, offshore accounts, Renunciation, Social disadvantages of U.S. citizenship and tagged Afroyim v. Rusk, Americans Abroad, FATCA, Levin, renounce US citizenship, Robert Wood, Schumer on May 5, 2014 by renounceuscitizenship.